Okay, I’ll concede that this photo looks like alien foeti on a slab. But I promise you, it’s very tasty. When cooked. Pork escalopes. I used 125g for two people. Bash some pork escalopes with a heavy implement. Cut into, oh, 3 inch pieces. 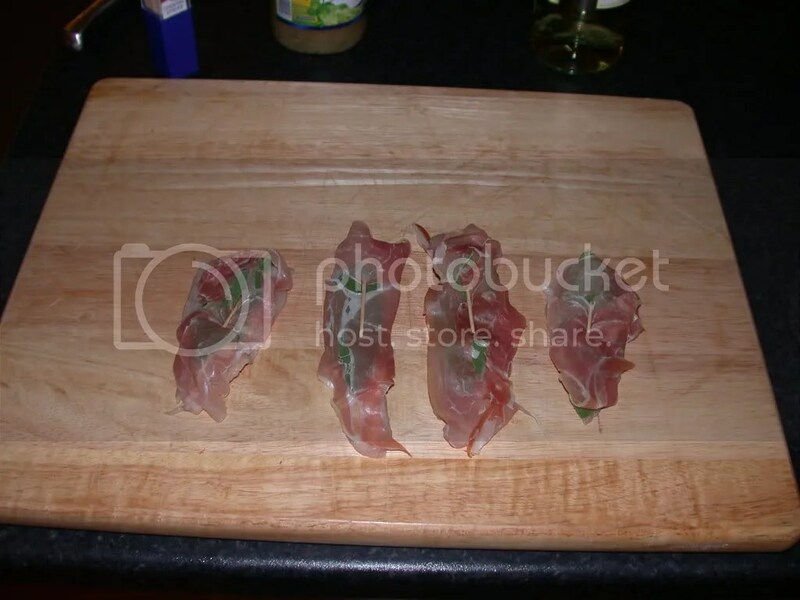 Lie one sage leaf on a piece of escalope, then lie a slice of parma ham on top. Secure with a cocktail stick (this is the stage I’m at in the above photo). Heat some butter in a pan, a generous knob. When the pan is good and hot put the escalopes in ham-side-down and let it cook for 3/4 minutes. Turn it over. Cook for another 3/4 minutes. Pour in a good glug of wine and let it cook off for a minute or so, to take the alcohol edge off it. Serve. I ate mine today with a couple of corns on the cob and carrots, which is entirely unsuitable but goes with my trying-to-eat-more-veg efforts. It would be much better with sauteed potatoes. My Italian grandmother would also make chicken saltimbocca, which is also delightful. She also threw some capers in for the last minute or so of cooking, but then, we’re freaks for capers in our family. Alien fetuses or not, I’d eat the heck out of this. Tarragon would work, certainly. Or fresh bay leaves maybe. THE NAME IS: SALTIMBOCCA ALLA ROMANA.